Not a sight you expect to see in the town car park. 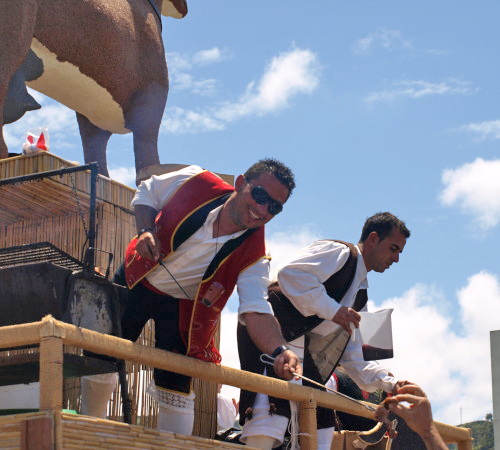 I’m used to seeing all sorts of weird and wonderful things happening on the streets of Puerto de la Cruz from avante-garde street theatre to traditional Canarian folk dancing but today, even I had to do a double take. When you glance over at the car park from alongside the harbour, there are some things that you simply do not expect to see. “There are elephants in the car park” I said to Jack, not something you hear yourself say very often. Naturally, that got his attention and before I knew it he was off, like a latter day Alice, camera in hand in pursuit of a somewhat larger, but equally swift quarry. The elephants were merely strolling, but nevertheless managed to cover the ground at such a speed that I could see Jack’s little legs having to run to keep up. I followed in the wake of grinning faces, exchanged glances at mobile phone photos and wide eyed children. It was easy to follow their trail. I lost sight of the elephants as they rounded windy corner and headed down towards Plaza Europa but even if I hadn’t gotten to the corner just in time to see them head into the Plaza itself, I would have been left in no doubt as to which way they’d gone. A pandemonium of screams greeted the gentle giants from a large group of schoolchildren who were sitting in the Plaza under the supervision of their teachers. The noise brought a smile to everyone’s faces and a contagious buzz of excitement that took me instantly back to my childhood and the thrill of seeing the circus arrive in town for the August Bank Holiday weekend. The elephants stood side by side in front of the children, gently swaying to and fro until a plastic shopping bag of apples was placed in front of each of them. They proceeded to lift the apples one at a time and devour them using their trunks with more dexterity than the average human wielding a knife and fork. When the larger of the two had finished his bucket full, his trunk wound over to the bag of apples in front of Junior, which elicited a squeal of collective delight from the children. Classic stuff..Nellie the Elephant packed her trunk tum te tum.. 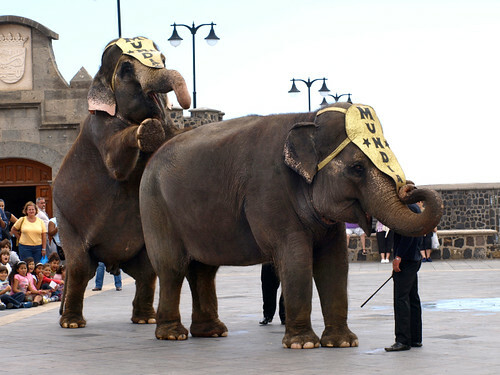 When their snack was finished, the elephants gracefully left the Plaza, the smaller one walking on its hind legs with its front feet firmly planted on the backside of the one in front and to the frantic applause and shouts of ‘adios’ of the kids. I’m sure I can’t have been the only one there to wipe an eye whilst grinning like a fool. With the elephants gone, the clowns took over and after them, acrobats on a trampoline and then more clowns, all introduced by the ringmaster in his splendid crimson tailcoat. 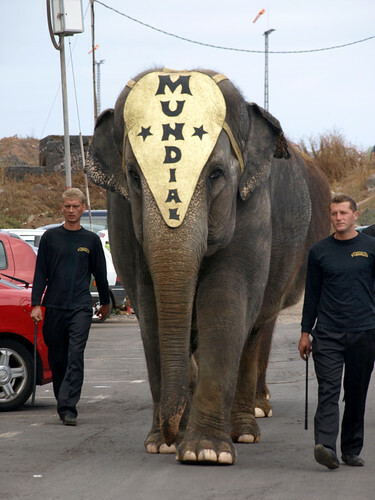 Tickets were given out to everyone offering discounted seat prices at the Gran Circo Mundial (World Circus) which would be performing in Santa Cruz all over the coming weekend and advising of location and the times of every show. I know we’re in the digital age now and social media sites are fast becoming the mainstay of effective marketing and I subscribe to that wholeheartedly. But as far as old fashioned promotion of an upcoming event goes, I simply can’t think of anything that would have been more effective. I’ll be going. And I bet everyone else in that Plaza will be too. The views are well worth the uphill slog. I woke up yesterday to one of those perfect summer mornings. The sun shone down from a cloudless sky, the birds were in full voice and the warm air carried the scent of the last of the jasmine. 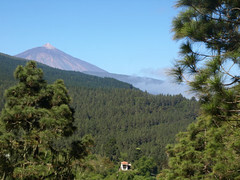 On the mountainside above us, the ochres, mustards and russets of Mount Teide saturated the skyline. In short, it was the perfect day for taking to the hills. 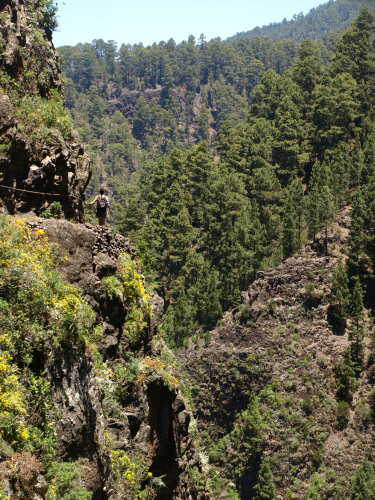 It’s been a while since our last ‘serious’ walk so I knew the 600 metre ascent from the La Caldera forest pista to the top of the ridge was going to make itself known to my legs and lungs, and I wasn’t wrong. Stripping layers and pinning hair up as I went I found myself sweating, gasping and grunting my way up the forest path whilst bitching about the 3 litres of water, waterproofs, sunscreen, lunch etc. that I was carrying in the rucksack. stone gate that marks the end of the ascent and took a well deserved break on a promontory looking out over the entire valley with Teide shimmering above the emerald carpet of the Corona Forestal. For me, this is where the best part of this walk begins. 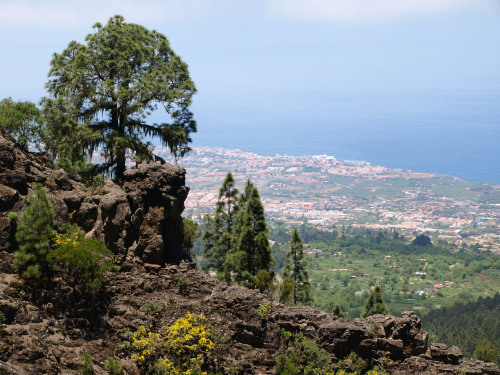 A fairytale dappled path twists, undulates and zigzags its way along the ridge through forests filled with the heady perfume of broom, pine and a multitude of endemic plants with the omnipresent Teide above and the shimmering Atlantic below. It’s a hiker’s paradise up here. Then we rounded a corner to see something absolutely unspeakably, outrageously incongruous in this rustic Eden; a red wire barrier had been placed right across the path with a sign showing a hand raised in ‘STOP’ position and the words “Alto! No Pasar!” written above it. That's what we think of that! There is NO WAY that I have huffed and puffed my way for an hour and a half up a 600 metre ascent to be told by some ‘job’s worth’ medio-ambiente worker that I have to turn back. The sign was given all the respect it deserved and climbed around. If we arrive at something that seems dangerous or if there’s some kind of activity that we’re encroaching on, we reasoned, then we’ll turn back. But as far as we could see, there was absolutely nothing going on and no earthly reason for the sign to be there. Drama and beauty - if you look closely you'll see me holding the handrail on this 'squeaky bum' section of the walk. any activity at all save for a couple of green plastic bags into which forest debris had been cleared and a few bags of cement and some large plastic containers of water lying by the side of the path at one corner. 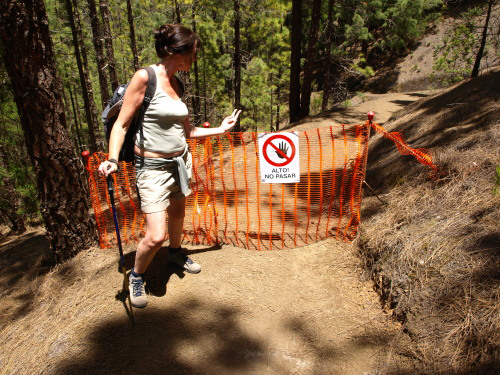 Eventually we arrived at the other side of this ludicrous path closure and similarly climbed over that to descend through the forest and back to La Caldera. I’m not advocating anarchy when it comes to warning signs on Tenerife, but with a little bit of commonsense and caution exercised, don’t assume that ‘access denied’ signs on this island are either current or necessary, because sometimes they simply aren’t. There’s a wonderful little photography exhibition in our local shopping centre of La Cúpula in La Paz entitled ‘Tenerife Ayer y Hoy’. It consists of 100 or so location shoots around the north of Tenerife with one photo taken between 50 and 80 years ago and the exact same shot repeated today. 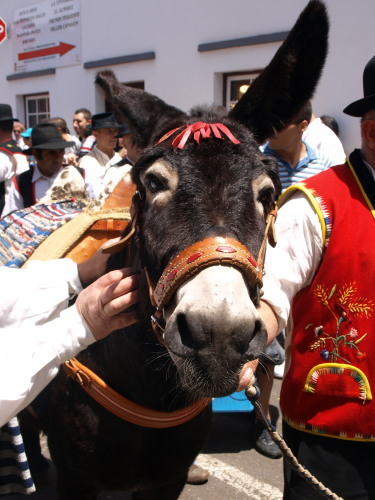 The locations are mainly in and around Santa Cruz, La Laguna, La Orotava and Puerto de la Cruz but with some around El Sauzal, Tacoronte, Los Realejos and Santa Úrsula. The photographs are interesting in their own right in terms of presenting an image of the ‘real Tenerife’ but they’re also surprising in terms of how little change there has actually been. 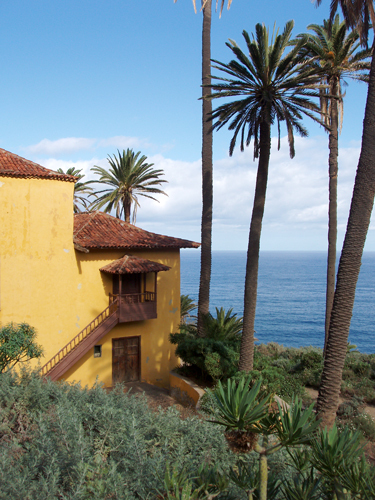 Particularly around La Orotava and La Laguna, some of the locations have barely changed at all except that today the buildings are looking smarter as a result of renovation and where once only dusty trails prevailed, tarmac now follows the original lines. The guard of honour of Canarian Palm Trees that run alongside Parque de la Constitución in La Laguna are actually more spectacular today as they’ve grown and produced rich foliage but now rows of housing border them where 50 years ago only fields existed. It’s funny to see the tramlines criss-crossing Santa Cruz in the ‘ayer’ photo just as they are today, although the trams themselves are space-age compared to the old style trolley buses. And funnily enough, Plaza España has almost come full circle (if you ignore the lake!) with wide open space and the replica gateway to the gardens of La Alameda del Duque de Santa Elena in clear view. Puerto de la Cruz is much more built up than it was. The area around Playa Martiánez is barely recognisable and some of the lovely old balconied buildings around the harbour and Casa Aduana are sadly no longer there. 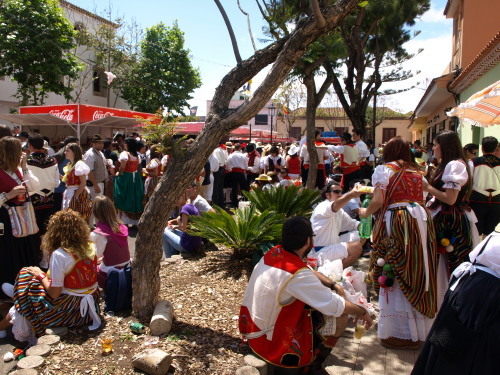 But the area around the Hotels Marquesa and Monopole are relatively unchanged and of course Plaza del Charco is still the bustling heart of the town. It’s just a small exhibition in the space outside the supermarket and I have no idea how long it will be there but if you get the chance, go along and have a look. “The morning sun when it’s in your face really shows your age.”? 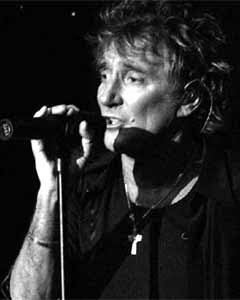 May 18th 2009 is the date set for that raspy-throated icon of Rock ‘n’ Roll, Rod Stewart to stride onto the stage at Adeje Golf Club to an anticipated packed audience which will no doubt include a fair smattering of Playa de Las Américas’ tribute acts looking to upgrade their performance to 21st Century Rod. The tartan scarf and feather cut may have gone (well, the feather cut is debatable) but the charisma and energy are still very much in evidence, even if the wrapping is considerably more sophisticated nowadays. Tickets cost from €50 but you can get your hands on some freebies if you book into one of the participating hotels and make a weekend of it. Why not really push the boat out and go for one of the €375 tickets which include pre-concert cocktails and the after party? It’s doubtful if Mr. Stewart himself will be there but you can always grab one of the tribute acts and a photographer and no-one need ever know the difference.